​Learn to play guitar without pain, bad habits, or struggle! ​I will sho​​​​w you how to practice correctly, and get maximum results from every practice session. Exercises that give you professional level technique and leads you to "effortless playing"
Guitar Principles is for any guitar player who has made a commitment to excellence. No matter what style you play, beginner or long time player - if you want to learn how to be as good a guitar player as you can possibly be, you are in the right place. This student traveled from New York to Las Vegas to achieve guitar excellence. If someone only ﻿wants to learn ﻿the ﻿chords of a song or the scales on a guitar neck, geez they don't need to pay me or any other teacher. Use google and find that info for free. But "how" to play these things? Much different story, and Jamie is THE master at this! Completely remove confusion from your practice. You will know and feel you are getting better with each practice session. Special methods to master all aspects of guitar technique, including scales, hammers & pulls, bar chords, etc. You will finally be able to really play all those guitars you have collected, and that pile of music on the shelf! What makes Guitar Principles so different? They tell you "what" to play, but never "how" to teach your fingers to play it! Time goes by, you wonder what is wrong with you - no talent? You feel desperate and go through cycles of quitting and then buying another guitar to "try again"
No matter how much you practice a song, it never gets any better. You know pieces of lots of songs. You can't play anything without falling apart - especially when you play for friends! You look forward to every practice session. You see and feel yourself getting better every time you practice! As time goes by, you have a solid repertoire of music you can actually play! You become knows as a really good guitar player. What a great feeling! Learn how to use your fingers like the pros do. How to discover deadly tension in the fingers that are ruining your playing. You can move your fingers easily on the strings. Learning new music becomes fun & easy! It's free, no email address required. I look around at the state of instruction for guitar, and I only find one person out of all guitar educators, who bases instruction on the science of producing sound, the biomechanics of doing it, and the neurology of learning to do it well. ​Jamie Andreas, of course. I just don't understand how out of 7 billion of us, only one has recognized the need to understand how our bodies and brains work, and how to apply that to playing and teaching guitar. Learning Guitar Is Not A Mystery! Learning to play guitar does not have to be difficult. Learning to play guitar does not have to be a hit-or-miss affair, works for some, not for others. There is an absolutely sure fire way of training your fingers and yourself to be as good a guitar player as you want to be and are willing to work for. 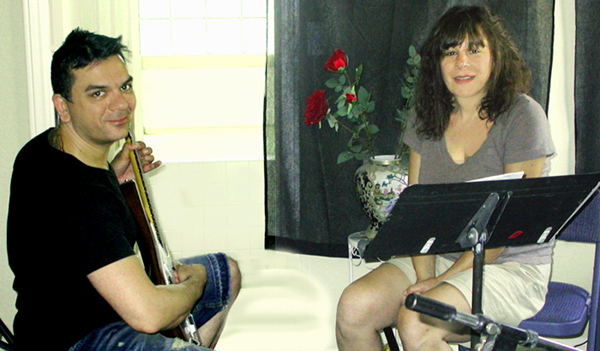 I have created that method and have been proving it works in the 47 years I have been teaching guitar. I call this method "The Principles of Correct Practice For Guitar". It has created thousands of good (and many great) guitar players, many who had given up any hope of learning after trying every other guitar method and lesson out there. Hi, my name is Jamie Andreas. A few years later, I began to take the mystery out of learning guitar. I studied the science of motor control learning, how muscles learn movements. I studied anatomy. I went back to teaching guitar with a whole new viewpoint. I experimented with my methods. I developed a powerful system for learning guitar that worked for everyone who used it. It didn't matter what style of music, or what the age or background of the student. If you have fingers, and follow my methods, you will become a good guitar player. "The Principles of Correct Practice For Guitar"
I want everyone who wants to learn to play guitar to succeed. I get very upset when I meet someone who has been buying guitars and lessons for years, and still can't play! I hope you will give me the chance to prove the power of "The Principles". 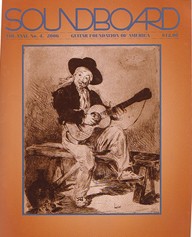 You will finally discover how good a guitar player you can really be! A good place to start is to discover what "The Principles" can do for your left hand control. Do I Need Natural Talent To Learn Guitar? ​Jamie Andreas has one goal: to make sure that everyone who wants to learn guitar is successful. 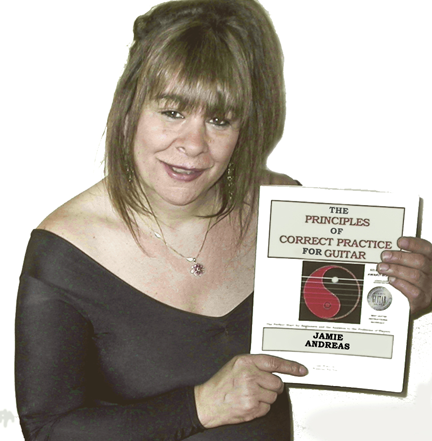 After her first 25 years of teaching, she wrote the world acclaimed method for guitar "The Principles of Correct Practice For Guitar". She put everything into this method that was essential for success on guitar. 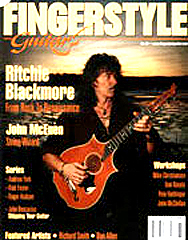 Called "The Holy Grail" of guitar books, the Principles has enabled thousands of students who tried and failed to play guitar for years or even decades, to become real guitar players. 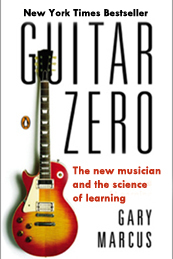 In 2012 Jamie was profiled in "Guitar Zero" (Penguin Press 2012), a study of how adults learn to play guitar. 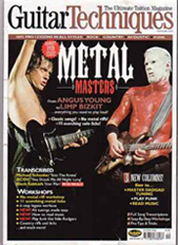 Jamie was interviewed along with some of the worlds leading guitarist/teachers, including jazz legend Pat Martino and Tom Morello ("Rage Against The Machine").